Medpac Review: Cool Travels and Accessories | Life, Sport and Diabetes - An everyday look at my life with type 1 diabetes. During December I was fortunate enough to spend some time in India for Christmas, to go travelling and to find out a bit more about what healthcare is like in that part of the world. 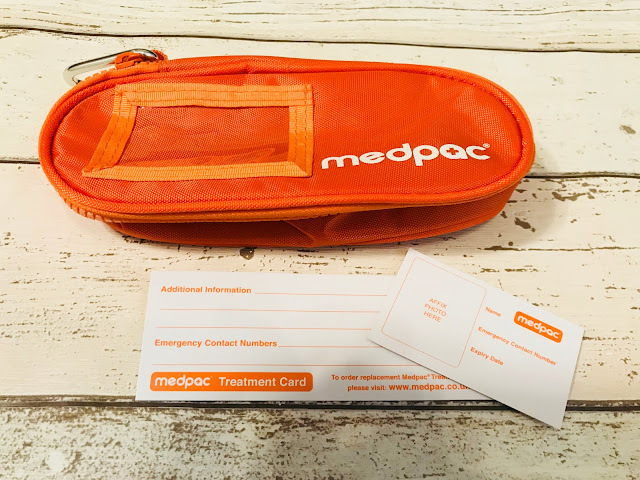 Before I left Medpac kindly sent me a number of items from their product range, of my choice, to put through their paces on my adventures and this is my blog review on my thoughts and findings on them. If you'd like to see the products in action, you can also head over to my YouTube channel and check out my latest vlog. 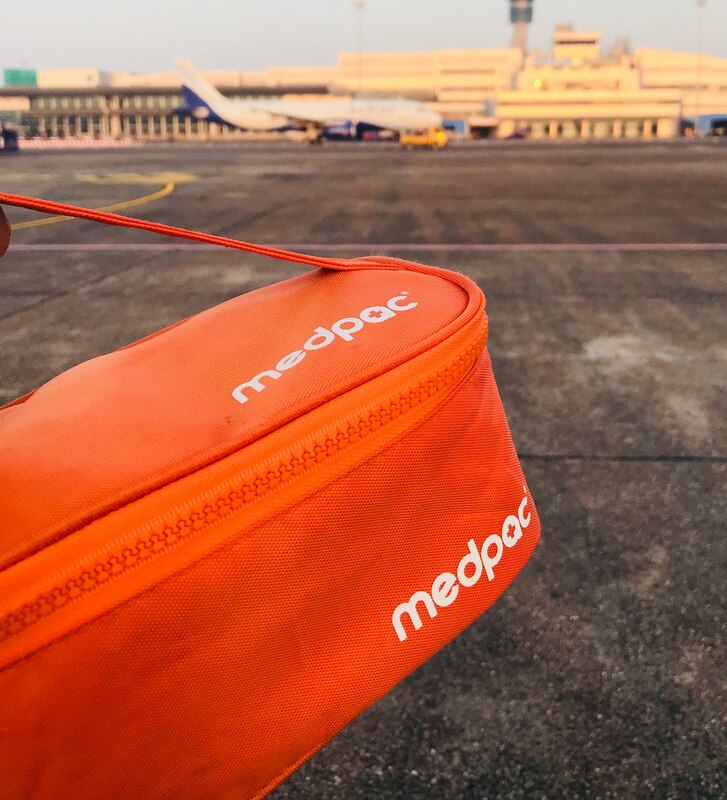 The first item I chose to take abroad with me was the large sized insulated Medpac case, which has a carry handle and is insulated on the inside to add the additional quality of helping keep things like my insulin and diabetes kit cool. 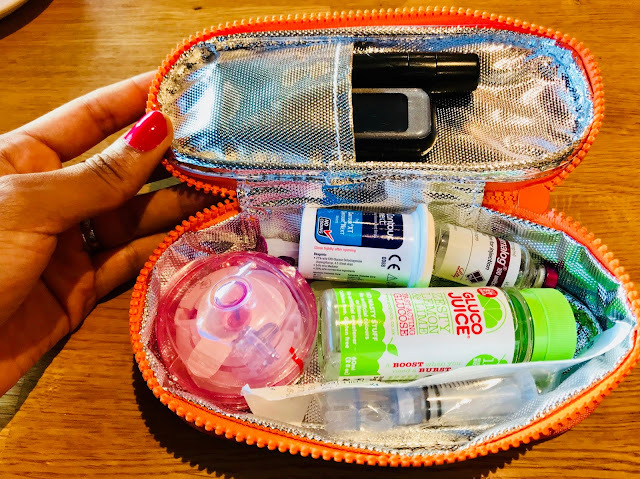 This case can also be used with a reusable gel cool pack, which I popped in the fridge the day before I was due to fly, so that it would be frozen whilst travelling and stayed cool for duration of my flight to India. I was able to fit either two of my what I call 'insulin pen-sized' Frio cooling wallets in the case or one of the large wrap around cases and an insulin pen sized case, which carried my insulin. Not only, did I fly with the case as part of my carry-on hand luggage to India, but I also used it when I took domestic flights within the country too. I do travel with a medical letter from the diabetes clinic, but I didn't experience any problems travelling through the airport with the case. In fact I found the bright orange colour made my medical supplies especially visible to me. The zip mechanism was smooth and was never impacted by the heat, so I didn't have any problems getting in and out of the case as often as I needed too and it's size meant that I could fit the whole thing in the fridge to keep cool when I stayed in different hotels around India. 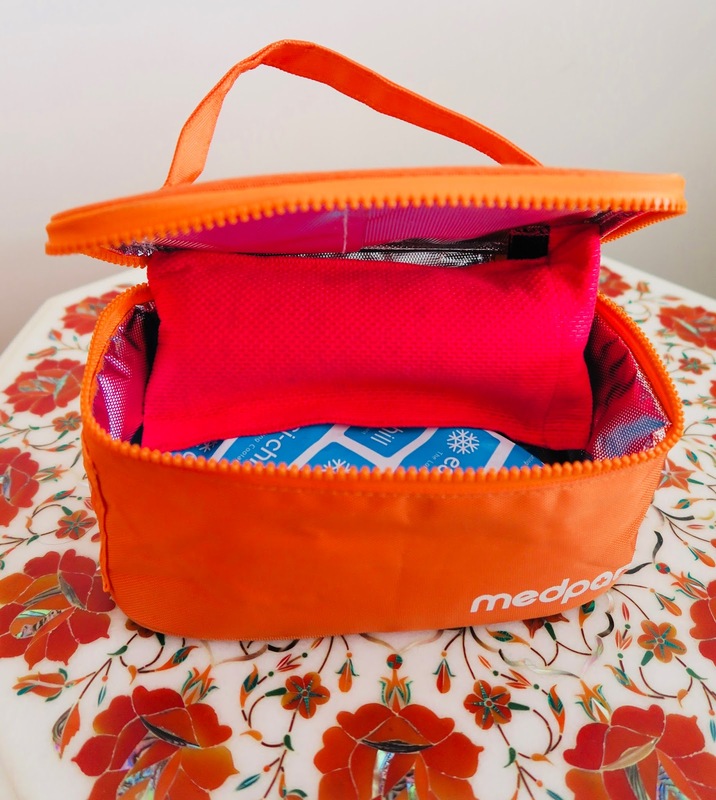 The next item I tried, and perhaps what became my favourite, is the small insulated Medpac case. I loved it for it's compactness, but also because of the depth of the interior. I can easily fit what I call my 'daily diabetes essentials', such as my blood glucose testing kit (metre, finger pricker and strips), a source of fast-acting glucose in case of hypos, spare needles, back-up insulin pens and a change of infusion set for my insulin pump. Which is a surprising amount for such a small case, but as a result of its size, it meant that I could put the case inside my handbag without it taking up too much room. Or, I could use the handy reinforced metal clip on the small case, to clip the bag to my rucksack when I was travelling, or to the seat in front of me when I was travelling on the plane. Carrying this case meant that I had quick and easy access to my daily diabetes kit on-the-go, which is what good diabetes accessories are all about- making life with diabetes easier so you can carry on with your adventures. The small carry case was splash proof and as I mentioned, is also insulated, which made carrying the spare vial of insulin I use to fill up my pump with, helpful. 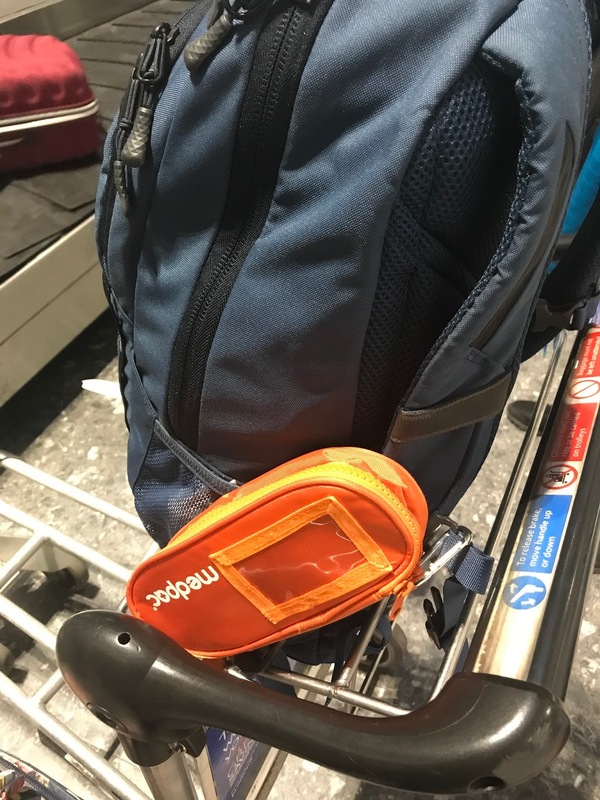 I've continued to use this case since arriving back in the UK and once again, I've found the orange colour makes the case handy to spot when I put it down at home. The other thing about this product is that there's also a plastic insert on the outer layer that comes with a card that you can insert that can hold details about you, your medical condition and/or your next of kin, in the case of an emergency or in the terrible event of the diabetes kit being lost. I also had the pleasure of trying the Medpac Active case, which is made of more of a neoprene fabric than the nylon of the other cases. Which I find works to its advantage because there's more stretch and flexibility, so my experience was that when I was clipping the case strap around my waist, it bent with the contours of my body for a better fit. Surprisingly, the Active case is also insulated and I say this because I've never used one with that feature before in the years that I've been doing sport. And which was a useful property to have in the Indian heat whilst on adventures to visit the country's many wonders. I even decided to put it through its paces when I returned home, by taking it to Parkrun with me and running 5km with it and I was pleasantly surprised again. Initially to look at, the case looks like it has good depth, so I wondered whether this might affect how streamlined it was when I run. However, even wearing the Active case on the outside of my sports clothing (another benefit that I'll go into now), the depth meant I could carry all of my essentials so that they didn't push into my back as I ran. Which gives you confidence when you're out exercising away from your sports bag, as does the fact that the case has 'Medpac' written on it, because this made me think that if I wore the case on the outside and ran into any difficulties with my diabetes whilst out on the course. Somebody would easily be able to identify that I was carry medical supplies and might need them. So in conclusion, I highly rate the Medpac range that I tried for my travels and I think the proof of this is in the fact that I'm still using them on a daily basis back at home. They're made from light materials, are durable and easy to wipe clean. 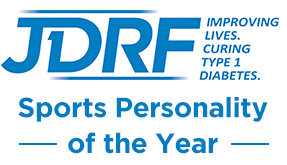 They fitted in with my daily diabetes life seamlessly and the diabetes products I use to keep insulin cool that I already own. I was impressed by the thoughtfulness and consideration that had gone into design elements such as being able to add information cards to the cases for identification and I think that with reflection, having specific carry cases for my diabetes products, especially those that needed to be kept cool gave me confidence when travelling too. This blog post was kindly sponsored by the team at Medpac and the products featured were given to me by Medpac to try, with thanks. However, all views and opinions are my own.